Working out has become an integral part of the day for many people. More and more people have started to realize that they can benefit a lot by eating healthy and exercising. There are many diseases and conditions that have been linked to lack of enough physical activity. There are many ways a person can increase his/her physical activities, but the best option has been fitness equipment. There are many different types of fitness equipment in the market. Choosing one from the many options can be overwhelming since you cannot easily know the differences and which will give you a tougher workout. Treadmills have been a favorite for many people and has proven to be an effective fitness equipment. Instead of going out to run around the block, you can easily do it within the comfort of your own home. There are also different types of treadmills in the market. The type of treadmill used by different people all day is not the same with the one used at home. The Nordic track commercial 1500 treadmill is one of the known fitness equipment. It is cheaper compared to other treadmills in the market, making it more affordable for many. Nordic Track is one of the most popular at-home and commercial brands of fitness equipment. It offers a variety of treadmills, elliptical machines, exercise bikes, ski machines and inclined trainers. Many of homes with this equipment have the consumer level models while gyms and other workout facilities have the professional/commercial line of fitness equipment. The quality of Nordic Track treadmills will depend on whether it is the professional or personal line. The Nordic Track C1500 Treadmill is iFit compatible to ensure that the workout is more engaging. 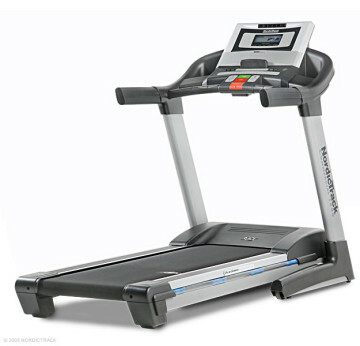 This treadmill can withstand commercial use but has become popular among home users who have plenty of workout space. There is a one-year subscription to iFit workouts included in the purchase price. It has a 3.0 HP DurX motor that can handle heavy training for long periods of time. The treadmill has a wide-screen display that can able the user to see different data streams at the same time. There is also a facebook application that the user can use to track the progress in treadmill races against friends. Best of all, the wireless iFit technology will let you experience actual trails from different parts of the world and it will incline and adjust and mimic the terrain. It comes with 28 workout programs that are inbuilt. The intermix Acoustic sound system gives a user the option to dock an MP3 player or an iPod. The treadmill has a 60″ long durable and quiet track, this ensures that taller runs can easily use the equipment. The DuraStride Adjustable Cushioning will reduce the impact on the joint by 15 to 33 percent; the user has the option of setting the cushioning he/she wants. For those who want more efficient toning, the track can be inclined to 15 percent grade. The equipment has a lifetime warranty on the frame and motor, with a two-year warranty on the parts. There is also a one year of in-home service. The Wireless iFit technology is one of the main selling points of this treadmill. If there is no wireless access in the workout area, then the one-year iFit subscription included will be a pointless investment. The assembly of the equipment can be unwieldy. Several people might be required in carrying and assembling the parts. The treadmill is a great value. It has all the important basics of a powerful motor, a long and durable track, and excellent entertainment. The inbuilt workout programs will provide a personal training and motivate users.